This Penne with Basil Almond Pesto is absolutely delicious. It’s just as great served warm as an evening meal or served cold as a summer pasta salad. It’s the perfect picnic grub or potluck dish. The roasted baby tomatoes and peppers take some time to roast but it’s worth every second of your time. They add a phenomenal smoky-sweet flavour and refreshing touch to the pasta dish. 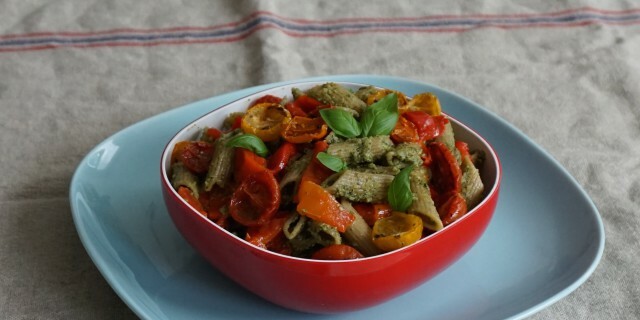 The sweetness and freshness of the roasted tomatoes and peppers works really well with the nutty and herby pesto and hearty pasta. For the Basil Almond Pesto, I have used roasted slivered almonds and salted ricotta or ricotta stagionata. For a dairy-free (vegan) version, you can skip the ricotta and use 3/4 cups of almonds instead of half a cup. For a gluten-free option, brown rice penne pasta is a really great choice. If you have no problems eating gluten, I would recommend using a penne pasta based on an ancient grains, for example, 100% whole emmer or spelt penne pasta. Preheat the oven to 150 degrees Celsius. Add the tomato halves to a baking tray lined with baking paper. Drizzle with olive oil and the balsamic vinegar and season with coarsely ground sea salt. Roast for around an hour or until semi-dried. They should still be a little soft on the inside. Preheat a grill pan to high or, alternatively, roast the peppers over an open gas flame (if you have gas stove). Roasting over a glas flame will be a quicker but I don’t have a gas stove so I personally use a grill pan. Read more about roasting your peppers over a gas flame here. To prep the peppers for each one of the methods, use a sharp knife to cut around the core and to remove the stem and seeds. Place the sweet pointed papers on the grill pan and grill them, turning them around every now and then, until completely blackened on the outside. The skin should bubble up and become lose from the flesh. Remove when ready. Allow to cool down. When cool enough to handle, peel of skin and slice the flesh in thin stripes. Bring salted water up to a boil in a medium-sized saucepan. Add penne pasta and cook until al dente. Cooking time will depend on the type of pasta you are using. Drain and then drizzle with olive oil. Mix in the olive oil thoroughly and then set aside to cool down. Add all the pesto ingredients to a food processor. Blitz until all ingredients have formed into a chunky paste. If the pesto is too firm, you can add more olive oil or just a little water. Add the penne pasta to a large salad bowl. Mix in the Basil Almond pesto and then, very gently, mix in the thin pepper slices and semi-roasted tomatoes. Season with freshly ground pepper and sea salt to taste. Serve with fresh basil leaves, a drizzle of olive oil and a squeeze of fresh lemon juice.